17/10/2013 - Costa Rica adhered today to OECD legal instruments on Internet governance and international business conduct, demonstrating its willingness to align its policies to best practices in these areas and work together with the Organisation. Costa Rica’s signature of the Declaration of the Future of the Internet Economy and the Declaration on Propriety, Integrity and Transparency came during a public meeting in San Jose featuring President Laura Chinchilla and OECD Secretary-General Angel Gurría. Mr. Gurría welcomed Costa Rica’s adherence and drew attention to the country’s recent decision to sign the OECD’s Declaration on International Investment and Multinational Enterprises. 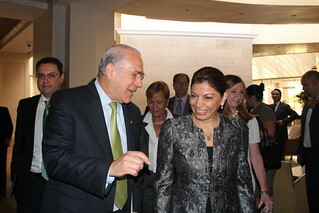 Mr. Gurría’s 16-17 October visit to San Jose underlined the OECD’s engagement with Costa Rica in a range of policy areas following the Ministerial decision of last May to intensify co-operation with this country. Mr. Gurría also discussed the Investment Policy Review of Costa Rica, which was undertaken to accompany the country’s adherence to the Declaration. The Review shows that Costa Rica’s inflows of foreign direct investment (FDI) have increased at a significant pace, growing on average 13% per year over the past decade. Manufacturing activities make up a large part, while the share of investment flows into the services sector has also jumped in recent years, boosted by the opening of the telecommunications market. Make better use of Public Private Partnerships (PPP) in transport and electricity, develop management expertise, and offer more opportunities for foreign investors to participate in PPP projects. This will help modernise the electricity sector, meet growing demand and ultimately reduce costs. Streamline and modernise procedures for doing business and cut red tape to facilitate domestic and foreign investment. Reinforce partnerships between the government, universities, R&D centres and the private sector to meet a growing gap between supply and demand in priority sectors, notably high-tech industries. Continue its efforts to fight corruption in the public sector and foreign bribery as set out in the Guidelines for Multinational Enterprises, part of the Declaration.